How much would you pay for a broken smartphone that was signed by Rihanna? Well someone decided that it was worth $66,500. Hit the jump to see how a broken cell phone came to have Rihanna’s signature on it. At an NBA Playoffs game between the Clippers and the Thunder, Rihanna was sitting next to L.A. Police Commission President Steve Soboroff. Soboroff, noticing the pop star, asked if she would mind taking a selfie with him on his cell phone. She obliged, but dropped the phone and broke they screen before they could capture the photo. Soboroff brushed it off, telling her not to worry and all would be well if she would just sign the phone with a marker. 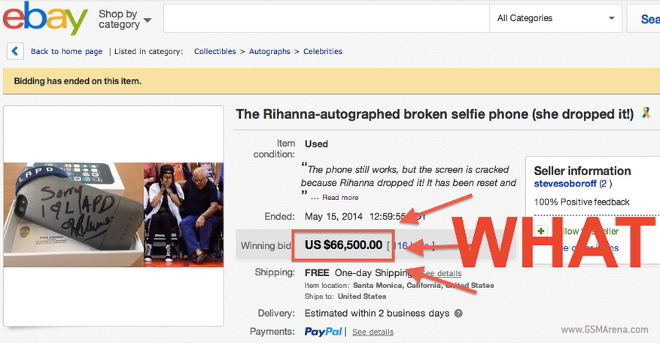 Rihanna obliged and then Soboroff got an idea: sell the phone by auctioning it off on eBay. Now Soboroff didn’t keep the money for himself; he donated the proceeds to the LAPD cadet program and Rihanna even contributed 25k of her own money, giving the Los Angeles Police Department an extra $91,500 just because she dropped a phone. If only making money was as easy as breaking some consumer technology every now and then.